A Benue State Npower beneficiary Terungwa Jacob becomes a Lawmaker as he won Benue State House of Assembly seat. Hon. 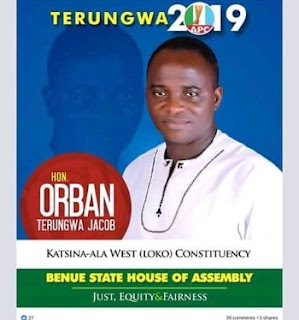 Orban Terungwa Jacob, of the All Progressive Congress, APC, won the Katsina-Ala west (Loko) State Assembly Constituency seat. On behalf of all the Npower volunteers, I say congratulations. Use your new position to help push laws that will help better the lives of ordinary citizens in your community and Nigeria as whole.